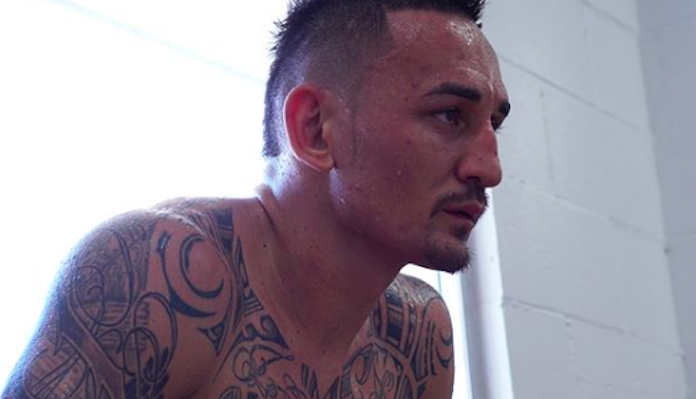 The year 2018 has not been particularly kind to UFC featherweight champion Max Holloway. The Hawaiian champ has been scheduled for three fights — a title defense against Frankie Edgar, a last-minute lightweight fight with Khabib Nurmagomedov, and a title defense against Brian Ortega — but not one has come to fruition. Speaking on Good Show with Ben Ennis & JD Bunkis on Wednesday, Holloway divulged that in the wake of this string of cancelled fights, he’s been battling depression. “It just helped me as a person realize that sometimes you gotta slow things down to get things back correct,” Max Holloway said (transcript via MMA Fighting). “After this last one I dealt with some depression. I was talking about [NBA star DeMar] DeRozan. DeRozan talked about depression and that really shook me. He said that he wished that everybody was rich, that everybody in the world had money so they could understand that money does not make you happy. Having struggled with depression, Max Holloway wants to remind his fans that it’s important to talk to the people that care about you when you’re struggling. Wednesday, coincidentally, was actually World Mental Health Day. On this occasion, UFC middleweight champion Robert Whittaker also encouraged fans to speak up when their mental health is suffering. Max Holloway is scheduled to return to the cage at UFC 231 this December, where he will attempt to defend his title against Ortega. Robert Whittaker, meanwhile, is expected to defend his title against Kelvin Gastelum in the new year.